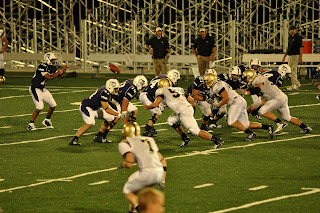 The beginning of a new era in college football as my son Mitch took his first snap from scrimmage. He plays for the University of Sioux Falls. They are ranked #1 in the nation in NAIA. They were national champs last year and this game was the first step towards repeating. Mitch plays tight end and fullback. He is a redshirt freshman.